Step 1 : Getting your ingredients together. Step 2 : Heat oil in a pan Heat Oil in the pan and when the oil become slightly warm, then put the garlic and fry it on medium heat.Constantly monitor because garlic can easily get over fried and then it will become bitter .It should be fried light golden brown as shown in the picture….. DO NOT PUT GARLIC IN TOO HOT OIL, you will burn it ! 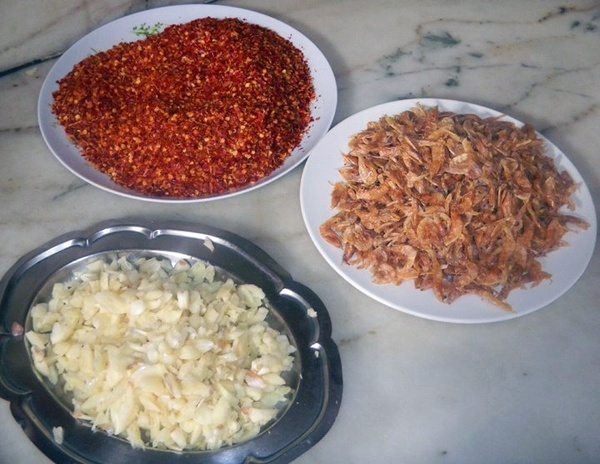 Step 3 : Soak the dried prawns in hot water for 5-6 mins and coarsly grind them up as shown in the picture . 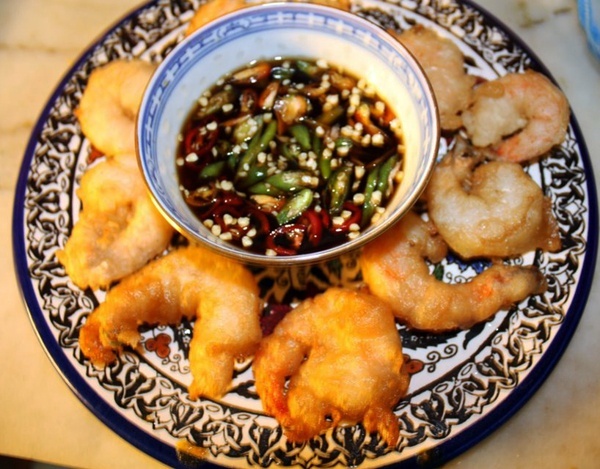 Step 4 : Fry the Prawn mix in the same oil in which the garlic was fried. It should be browned, the water should be dried up and It should be slightly crip. 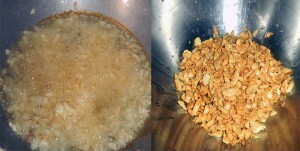 Then add the fried garlic and fry on medium heat for another 5 mins. Add additional oil if you make bigger quantities to store it for longer.This is a pickle so u can be generous with oil and u won’t be eating it in huge quantities , plus you want to store it longer . Final Step : After frying the garlic and prawns, put off the gas. If the oil and mixture is too hot, then the chilli will get burnt. 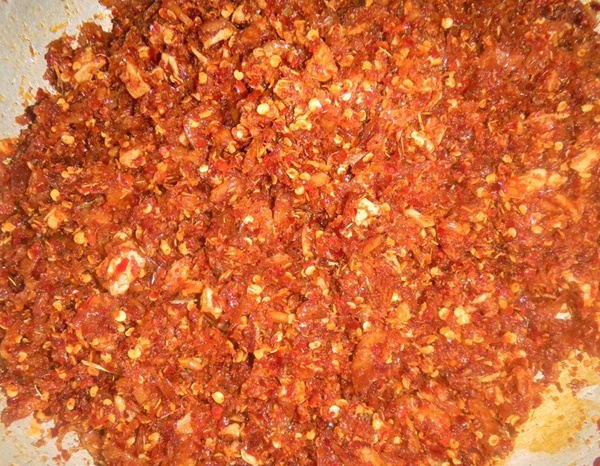 Now, add the dried chillies (coarsly grounded) according to your taste, Aginomoto and salt to taste. Mix it all well and VIOLA ! Done ! Note for Vegetarians : We also have a veg version of this pickle called SI CHAY ~ It is basically the same recipe. But instead of prawn, make it with 100% Garlic and it tastes equally good ! Shell and de-vein prawns. Leave the tails on for presentation purposes. FOR HOME MADE MIX : Sift flours together in a medium bowl. Add egg and soda water and mix until just combined (it is okay if the batter is a little lumpy). Allow batter to stand for a few minutes.